Email me about becoming a dealer for this product! Chris at KF7P dot com. Ball pin keeps movable extensions fixed until needed. Alignment tool for bringing tower leg into axis. Engagement bar is longer and has additional positioning slots. Positioning slots are angled for positive contact with tower rungs...no slips! 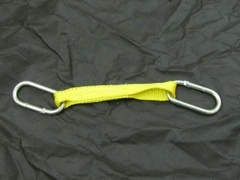 Lanyard loop for attachment of lanyard or carabiner. Longer tool = more leverage. 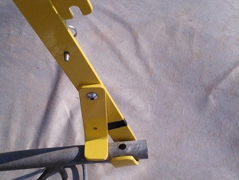 Pivot bolts are steel alloy shoulder bolts for better wear resistance. * Works on Rohn 55g, but hooked alignment tool on end won’t fit on larger Rohn 55g sleeve. All edges and corners beveled, sanded, and smoothed out before painting. User Reviews: What are other hams saying about this product? Well you used your head! Beautiful tool. 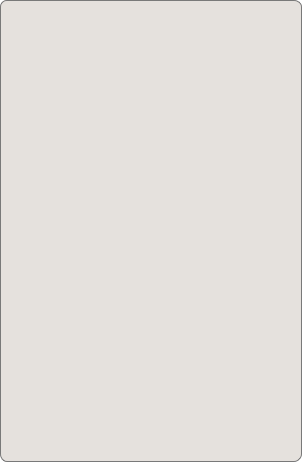 I can't wait to use it on the next Rohn project. Hurricane Matthew really did a number on Haiti, leaving a path of devastation and killing hundreds of people. 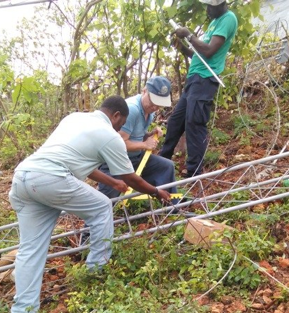 Pictured are some Haitian locals along with WB9BAT taking apart tower sections with a Yellowjack. This tower was part of a big AM broadcast station in Haiti. 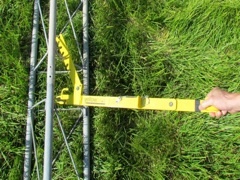 According to Leon, the sections never could have come apart without the assistance of the Yellowjack. 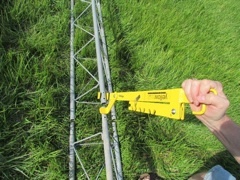 I purchased the Yellowjack for my tower assembly project. Using all new Rohn 25g sections I was thinking that the Yellowjack would not see any service, but I was wrong. I had one alignment issue, one section that would not align well with the screw holes and finally a section that needed to be separated and turned. Yellowjack made a big difference in completing the project with success.